If you can get past the horrid band name, the equally terrible album moniker, and the dreadful album art, Dada Life is not half bad. If you can get past the horrid band name, the equally terrible album moniker, and the dreadful album art, Dada Life is not half bad. Well, the band is half mediocre, but that's besides the point. Dada Life is a singles band, so what is it doing messing around with full-length releases anyway? 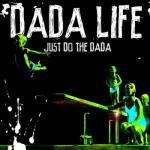 Just Do the Dada (don't worry, you don't have to) is full of pulsing, oscillating, chiptune-inflected electro that one can’t help but be afflicted by when it strikes you just right. It's rhythmically conservative, preferring to keep pace metronomically with a four-on-the-floor, but there's more than enough goose-bumps-initiating moments of synth-tastic wizardry to make up for it. The band has caught a bit of attention with "Happy Hands and Happy Feet", a not-so-happy slab of slightly incongruent Mortal Kombat techno riffage and faded-visage Cafe del Mar uplift that was released earlier this year. It's not the best thing the band has to offer, and the stretched, bent, and possibly glued-together vocal effect the track employs is repeated on just about every track throughout the album. The latter actually winds up working in the band's favor, though. It's a pretty cool effect, and one doesn't establish a dance cliché without repetition, repetition, reeeeeepi(tish)uhn. Certain tracks like "Don't Snort the Yellow Snow" may be truly grating. You may also find its sense of humor charming but not hilarious (its use of the double meaning of bleep works better some places, "Bleep me like you did last night" and "Let's Get Bleeped", than it does in others, "Sweet Little Bleepteen"). The band may not offer anything that, historically, hasn't been on the market since, say, Miss Kitten and the Hacker’s first album. However, there are places when doing the dada and living the dada life are not as bad as the band makes it seem.